Wisconsin hunters are being urged to kill feral pigs. They&apos;re also known as wild pigs, wild hogs, wild boars, or razorbacks. Whatever you prefer to call the domestic pigs gone wild, state wildlife officials are encouraging hunters to help eliminate that growing population of pesky pigs. Brad Koele, DNR wildlife biologist, says not only are the animals a nuisance when they root up the ground looking for food, they also prey on white-tailed deer fawns and ground nesting birds like grouse, turkeys, and songbirds. They also take away food sources for other animals. 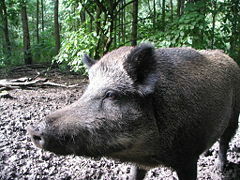 Koele says feral pigs are considered unprotected wild animals and may be hunted year-round with a valid small game license. Landowners don&apos;t need a license to shoot the wild hogs on their own property. If you bag a boar, you can use it for food, but be sure to report it to a DNR wildlife biologist to get it tested for disease.